The New Development Paradigm: Prospects and Perspectives for CARICOM. With global policy discussion calling for a shift in ideologies and thoughts that shape development—a New Development Paradigm—what are the doctrines that will guide Caribbean trade and development in the future? Confucius highlighted that one must study the past if s/he would define the future. An ideology employed to date within a wide range of models and methods such as economics, sociology, physics and technology, this concept has become sine qua non—essential to any development. Considering this, as the Caribbean region enters a new age, it is important to not only cite our successes and seized opportunities (for example diaspora networking and achievements in music, athletics and education), but also recognize and learn from previous threats and setbacks such as economic shocks, information and technology challenges, and issues of dependency. Referred to as ‘a new pattern of thoughts, beliefs and practices’ by Sir George Alleyne, Chancellor of the University of the West Indies, information revolutions not only create new industries but also shape a new logic or paradigm form, each paradigm form transforming the entire world economy through their increasing global influence. Throughout previous decades, this influence has been fortified by globalization, technological advances, the proliferation of trade agreements and multilateral conventions. International transformation, according to Carlota Perez, occurs because paradigm shifts encompass a set of new generic technologies and infrastructures such as energy, transport and governance, and organizational principles such as networks, and empowerment, which are capable of modernising the existing industries and governments. As a result, paradigm shifts result in a quantum leap in innovation and productivity potential for every single industry, activity and organization across society. As stated by Perez, “Ultimately, these paradigm shifts result in the appearance of an enormous new wealth creating potential, enabling and requiring a change in the direction of change across all industries and gradually across society… bringing a new way of producing, a new way of working, a new way of transportation and communication, and eventually a new way of living”. This catalytic period of change is now. Old conceptual tenets and previous development recommendations are breaking down (or rather have broken down). With the debt burden of the third world growing increasingly more insufferable and the continuity of net financial flows from the South to the North due to economic crises spawning a black hole of debt, economic and social hardship and general malaise; it can certainly be agreed that the Old Development Paradigm (ODP) has not reached the expectations of either the ‘rich’ or the ‘poor’. Thus, a new "dogma" for development must emerge. It is now crucial for the Caribbean society to rethink, reshape, restructure and redefine the future, if sustainable development and progress are to be achieved. Previously referred to by development activists such as Dr. Claudio Schuftan as lacking ‘true turning points’ and definitive actions; initiatives of the international development community (for example the United Nations (UN) Conference on the Environment and Development, the Vienna Human Rights Conference and the Rome World Food Summit) must now commit to embarking on a process to define a new development agenda. Though Schuftan (2003) has emphasized the importance of poverty alleviation in the NDP, he goes further than Stiglitz by propositioning economic objectives be measured instead as economic-development objectives. In his work, Schuftan argues that contrary to previous thought, the central issues of equity and poverty alleviation are not social but rather economic objectives. Hence, he calls for the exploration of a strategy combining capacity building, social mobilization and empowerment. This strategy, according to Schuftan, must encompass ‘a built-in poverty redressal objective that involves working with the poor as protagonists rather than passive recipients of development hand-outs’. In addition, he expresses the high importance of an on-going shift towards decreasing the skewedness in the income and wealth distribution, maintaining linkages between political, economic, and social factors of development, and ‘developing concrete transition strategies that fit local realities’; i.e. no one size fits all prescriptions. Schuftan’s research pars closely to the prescriptions of Caribbean economists, the Honourable Lloyd Best and Dr. Eric St Cyr, whose contribution recommended paradigm shifts on: 1) the methodology to be used and 2) the desirable destination to be sought. Based on Schuftan’s proposition, the NDP should view social policies as a prerequisite for achieving economic development objectives. 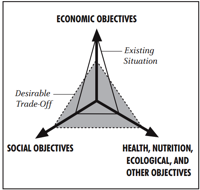 As such, the vertical axis of the diagram should be renamed economic development objectives. Like Best, St. Cyr and Schuftan, Undersecretary General of the International Federation of the Red Cross, Dr. Mukesh Kapila, has encouraged the importance of strategies that focus on overall sustainability. Dr. Kapila holds that the NDP should therefore primarily emphasize “the responsible use of resources to create and share wealth fairly so that everyone’s reasonable current needs are met without compromising the needs of future generations… therefore overcoming borderless challenges to sustain a common humanity”. Simultaneously, philosopher and economist, Amartya Sen, has identified “striking the proper balance between growth-mediated and support-led security” as the key for this new paradigm’s sustainability. Sen argues that economic growth (mediated security) alone does not guarantee trickle down; while direct (support-led security) interventions leading to the provision of public health/nutrition/environmental services, even if targeted, promote equity but only very indirectly and weakly. Governments have also weighed in. Within the past two years, newly democratised Bhutan has been one of the most vocal states on the elements of the NDP. The country has called for “a genuine change from our current materialist obsession, narrow self-interest and resource exploitation to a much broader and deeper view, which recognizes the goal of development as human happiness contingent on the wellbeing of all life forms” (UNDP Bhutan). As such, Bhutan has developed a new nine-factor indicator – the Gross National Happiness (GNH). The GNH stresses collective happiness to be addressed directly through public policies in which happiness becomes an explicit criterion in development projects and programmes. As highlighted by Bhutan Prime Minister H.E. Jigmi Y. Thinley, ‘since the present GDP-based system was devised prior to any knowledge of climate change or the finite limits of the earth’s resources, there is truly need for this change’. *This restructuring of mechanisms will form the basis of part two of this article.